You’ve heard of the Washington state winery explosion in Walla Walla, Yakima, Lake Chelan and Woodinville. But, do you know how many wineries there are right in the heart of Seattle? You might be surprised to hear that the wineries from South Park to Roosevelt number in the double digits. 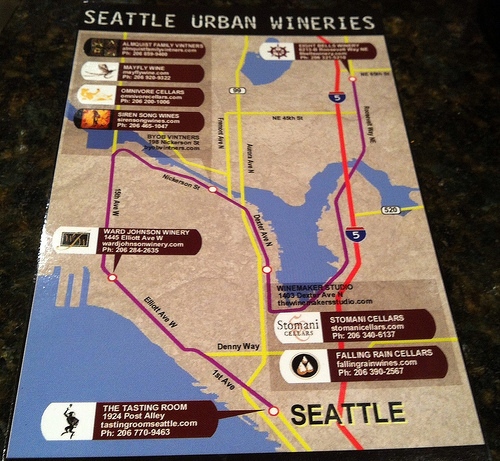 Fourteen of those wineries have joined together to form the Seattle Urban Wineries. All the wineries are open on the Second Saturday of each month for their Open House tastings. Many of the wineries are open on additional Saturdays and Sundays. You can easily get to 6 wineries in an afternoon with groupings of wineries in South Park, and around Queen Anne Hill. Of course, this all depends on how much time you want to spend at a location. If you do plan to visit, make sure you regulate your intake, stay hydrated and be responsible. I set out on a recent Second Saturday planning to visit 5 wineries in three locations by tracing a triangle around Queen Anne Hill. Stomani and Falling Rain share a facility on Dexter, up on Nickerson there are 5 wineries including Almquist Family Vintners and Omnivore sharing a space and then to the West is Ward Johnson winery on Elliot. My first stop was at Stomani and Falling Rain. I was really looking forward to this location because Stomani specializes in Italian inspired wines and Falling Rain specializes in French style wines (Bordeaux to be exact). I spent way more time at Falling Rain than I had budgeted. But that was OK, I learned that Judy was one of the first people to graduate from the WSU wine program in Prosser, her first vintage was in 2006, how focused she is on her barrel program and got an opportunity to taste through a wide selection of her wines learning many of the nuances involved in the wine making process. When Judy is aging her wines each varietal stays in its own barrel throughout the aging process. The grapes in her blends do not come together until they are combined at the very end of the process. She uses American (sourced from 7 different coopers) and French Oak from Cognac, Bordeaux and Burgundy. With all the time I spent at Falling Rain I didn’t get a chance to make it over to visit the wineries on Nickerson or to Ward Johnson. Each one of her blends starts with a specific varietal focus. The Arc-en-ciel begins with Cabernet Franc as the primary focus. The result is a wine that features dark currant, cassis, clove and white pepper that also includes some nice light herbal notes. With some time to breath you start to get cocoa, toffee, cracked black pepper, black cherry, clove and cinnamon. This is one of the only blends that Judy has made that maintained the same formula from the plan all the way to the finished product. The Mischief starts with a focus on Merlot. The 2007 features bing cherry, floral notes and cloves with a nice tart spicy finish. The 2008 features toasty dark fruit, earthy herbal notes with clove, cinnamon and a tart cherry bark spicy tannic finish. 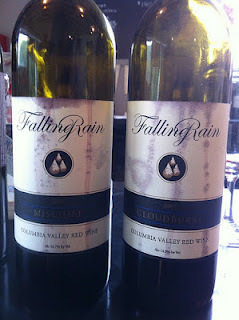 The Cloudburst begins with a focus on Syrah. The resulting wine features logan berry, spices, earthy mineral notes and pepper with a nice tart pepper spiced tannic finish with a bit of semi sweet chocolate on the tail end. Judy warns that her wines are big and tight when they are first opened so make sure to give them lots of time to breath (check out the details here). And pay particular attention to the 2009 Reserve Cabernet Sauvignon Judy says it is a Widow Maker! I will plan to make a stop on the North and West sides of Quenne Anne Hill another day so I can complete my triangle. That isn’t a bad problem to have! I highly recommend getting out to Falling Rain and any of the other Seattle UrbanWineries when you get a chance. You will not be disappointed.